Amazing post as usual !!!! Thanks for your work !!!! 1. Do you expect any other performance improvements in SNA or this is the best we can get ? 2. Any plans to switch/support glamor ? What are the longterm plans for this driver ? 3. Do you plan to remove EXA/UXA support when SNA is the default acceleration method ? It is certainly not the end of the road for SNA; though I think it is getting to being almost as good as it can get with the current design. There are a few kernel patches pending to enable extra features and acceleration of a few more code paths (though insignificant for the cairo workload, they help to accelerate application like Chromium) and I’ve just begun to overhaul the shaders used by SNA to accelerate the actual operations. That should produce some significant improvements for the RENDER workloads. Looking beyond that, I need to improve the protocol to enable greater offload from the client to the driver and GPU – the rate limiting step now tends to be the application itself and cairo is a big part of the bottleneck in the rendering process. 2. No. My long term plan for the driver is for it be the best possible in terms of stability, performance and features (including platform enabling). Glamor offers none of those, instead regressing on all. 3. Yes. Once SNA has had sufficient testing to be enabled by default, there remains no reason for UXA. Fedora 17 just delivered a new xorg-x11-drv-intel-2.20.1-1.fc17.x86_64 update which I got installed, however Xorg.0.log still reports UXA being enabled as an acceleration method. How do I enable SNA instead? I’ve got a GM45 as a GPU. Option “AccelMethod” “sna” in a /etc/X11/xorg.conf.d/20-intel.conf config file. Chris, how can I benchmark the two accel. methods on my laptop? Is there a dedicated test-suite, recommended benchmarks (maybe also cairo-based)? The best benchmark is obviously the tasks you use everyday. If you can find a way to measure those, I’ll be very happy to add that to the list of things to optimise for. > I’ll be very happy to add that to the list of things to optimise for. 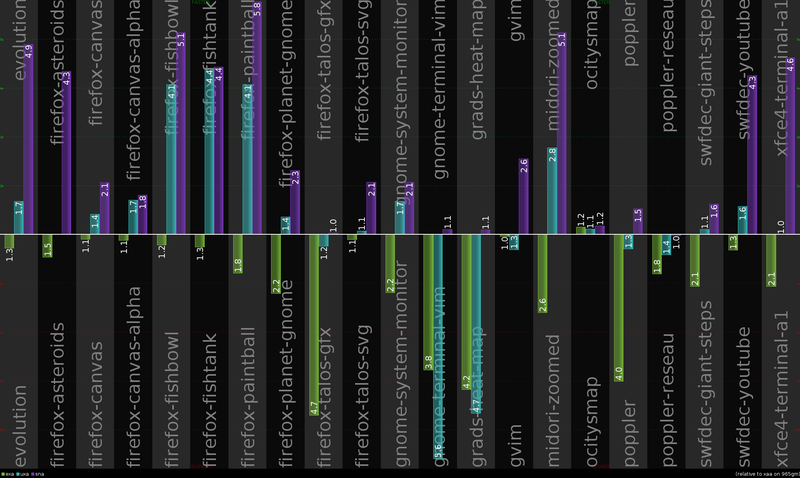 Probably Web browsers, HTML5 (canvas-2d, WebGL, gstreamer) is a good use-case candidate for optimizations. OK, thanks! I’ll get few numbers. Chriss i enabled SNA on Fedora 17 and it works great. I will keep using it and report any problems i find. One question though : after the move to wayland the rendering will be happening by cairo without X11. What back end are you planning to use for cairo and wayland ? will the performance be comparable to X11/SNA ? Is there hope for Mac-like smooth graphics on the desktop with wayland and cairo in the (hopefully) near future ? We’d need Fedora to start packaging cairo/drm along with cairo/x11! I’ve been also testing on Fedora 17, and the entire desktop feel a lot snappier. 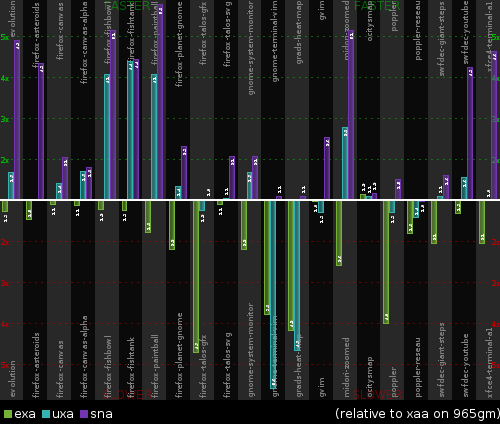 The fish benchmark makes the session hang (I think that’s a SNA bug, Fedora 17 is still at the 2.20.1). VT still work though and I could get another shell and do stuff. Oh, that’s a cairo bug… It’s not hanging just taking seconds per frame as Cairo is doing its own fallback instead of noticing that it has two Xlib surfaces that it can render between. Fixed in cairo-1.12. Remember that Wayland is not a panacea, it is just an encapsulation of frame events into the core of the rendering protocol. It is technically possible to do everything Wayland does through X11, and we will only get the “every pixel is perfect” desktop if and only if every single toolkit/application are rewritten to give that smooth experience. So far the evidence has been that cairo-gl is simply not performant on any libGL, least of all 965_dri.so and 915_dri.so. It is going to be a problem in the brave new future. > least of all 965_dri.so and 915_dri.so. It is going to be a problem in the brave new future. Is it because of a possibly high context-setup overhead induced by toolkit/cairo/GL for simple 2D drawing operations? If yes, would this still be an issue if Weston have been targeting a (straightforward) 2D drawing API instead of OpenGL (still w/ an inter-operable surface allocation back-end)? Nope, the issue lies within the overhead of the mesa state tracker, inefficient command generation and poor buffer management of the driver. I do remember that there was a talk scheduled during FOSDEM 2012, about optimizing 2D rendering on modern graphics stacks (post-Wayland) or something similar, however that talk didn’t happen. Do you still have that presentation and would it be possible to share it on this blog?